The Ogun state governor, Senator Ibikunle Amosun has pleaded with aggrieved supporters to swallow their pride and let peace reign. The governor who spoke during the All Progressive Congress (APC) Presidential rally in Abeokuta, the state capital appealed to the aggrieved supporters not to disgrace him. PLATFORM TIMES observed that some aggrieved supporters of the governor allegedly belonging to Allied Peoples Movement(APM) present at the rally interrupted the APC National Chairman, Comrade Adams Oshiomole when he mention Dapo Abiodun as the governorship candidate of the party. It was also gathered that the aggrieved supporters reportedly chased out supporters loyal to the APC governorship candidate who were putting on yellow and other materials with logos and inscriptions of Abiodun. 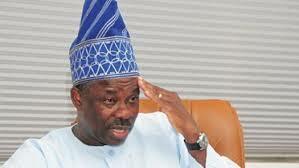 Amosun had earlier urged supporters to be calm and let peace reign. He said, “For the respect we have for President Muhammadu Buhari and in the overall interest of our great party, the APC, let all of us swallow our pride; let us subdue our anger. “The great youth of Ogun state, it is about you. Buhari is the president that acknowledge the effort of our father, MKO Abiola. The governor also urged supporters to vote President Muhammadu Buhari while saying other issues will be resolve after the governorship election on March 2.